and possible opportunities in the utility's financial crisis. As PG&E Corp. and its utility subsidiary Pacific Gas and Electric Co., or PG&E, teeter on the edge of insolvency over mounting wildfire liabilities, clean energy advocates say California's ambitious energy efficiency, renewable energy and overarching climate policy targets are in jeopardy. But the debacle could also breathe new life into legislative and regulatory reforms seen as critical for California to achieve its clean energy targets, they added, which include slashing greenhouse gas emissions 40% by 2030 and 80% by midcentury, both from 1990 levels, and reaching 60% renewable electricity by 2030 en route to total decarbonization of California's power sector by 2045. "PG&E is the largest clean energy investor in the country and the state," Ralph Cavanagh, co-director of the Natural Resources Defense Council's energy program, said in an interview. With the specter of a sweeping reorganization now clearly in view through a likely Chapter 11 bankruptcy protection filing at the end of January, the San Francisco-headquartered utility's clean energy investments are "all at risk," according to Cavanagh, who noted recently approved electric-vehicle charging programs and energy storage outlays, and long-standing renewable energy and energy efficiency commitments. "They must be defended, but they are not doomed," he added. When PG&E filed for bankruptcy protection in the wake of the 2000-2001 energy crisis, the NRDC helped to protect the utility's clean energy programs. "The defense was successful in 2001 and it can be again," Cavanagh said. Such efforts would come on top of considerable headwinds renewable energy resources under contract to California electricity suppliers are already facing. Local power agencies known as community choice aggregators have assumed a significant role in procuring new renewable resources in California, owing in large part to a customer exodus in PG&E's service territory, while wildfire-related financial pressures on the utility have exposed existing contract counterparties to new risks. S&P Global Ratings, for instance, on Jan. 11 issued a multinotch downgrade into junk status of Berkshire Hathaway Energy's Topaz Solar Farm, the single largest solar project in the United States, and the operators of two other power plants, because their output is committed to PG&E under long-term contracts. Natural gas pipeline operators that supply gas to PG&E also are seeing their credit ratings at risk. Renewable power plant developers now fear they may have to defend their legacy contracts in court, many of which were signed at prices well above today's levels. "As underscored by [California] Governor [Gavin] Newsom, contracts with energy suppliers, including renewable energy providers, need to be honored in the PG&E bankruptcy proceeding," Jan Smutny-Jones, CEO of the Independent Energy Producers Association, said in an email. "Terminating these contracts in bankruptcy will have costs and send the wrong signal to future investments in clean energy." Yet, defending PG&E's clean energy programs and contracts in bankruptcy court, even if successful once again, would not go far enough to address the current crisis, according to Cavanagh. "California's utilities are all exposed to these [wildfire] risks and the risks have to do not just with climate change but with California's dysfunctional system of wildfire liability," he said. 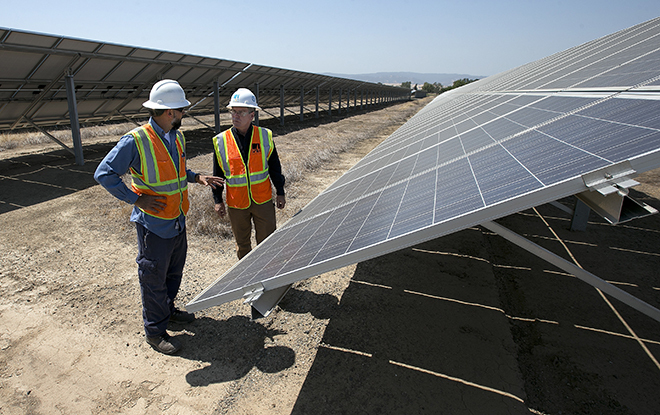 "California's electric utilities are critical clean energy partners. If they face financial ruin ... we're all losers." While state lawmakers in 2018 passed a measure, Senate Bill 901, that gave utilities limited financial protection, they neglected deeper reforms to wildfire liability. In particular, Cavanagh called on legislators to change how the state applies the legal doctrine of "inverse condemnation," under which courts have found utilities strictly liable for wildfire damages caused by their equipment even if they followed safety protocols. For now, at least, California lawmakers seem hesitant to put such reform on a fast track to avert PG&E's bankruptcy filing. As the crisis continues to unfold, however, Cavanagh believes opponents of wildfire liability reform — including insurance companies, ratepayer advocates and attorneys for wildfire victims — will find "fresh evidence" that a fundamental change is necessary. "When utilities go into bankruptcy, wildfire victims become one more set of creditors facing an inadequate amount of money in competition with everyone else," he said. "That's not where we want our wildfire victims and it's not where we want our clean energy programs." 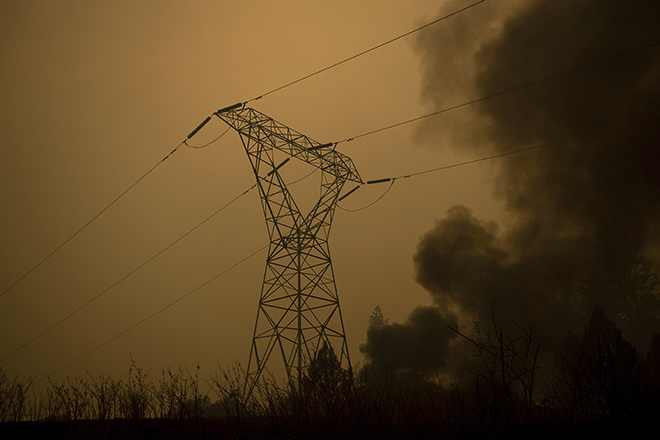 Smoke billows around transmission lines near the Camp Fire in Northern California in November 2018. While PG&E has yet to unveil its reorganization strategy, the sale of its natural gas business is one option. Another is the sale of its electricity transmission assets, suggested Craig Lewis, executive director of the Clean Coalition, a California advocacy group that promotes distributed energy resources. "While I've seen discussion of divesting gas assets, if there's only going to be one divestment strategy for PG&E to raise money I believe it should be divesting the transmission assets," Lewis said. Doing so would eliminate a "conflict of interest" at the utility between transmission and distribution grid investments, he added, pointing to higher investment returns for the former but also higher risks related to wildfires. "The transmission grid is the source of a lot of these fire issues and it is driving PG&E into this path of bankruptcy," Lewis said. Freed from transmission assets, the utility could then transform into a distribution grid operator, he added, focused on local renewable resources, energy storage, demand response and other distributed energy technologies that could reduce or eliminate the need for investments into the transmission grid. Given the wildfire risks associated with its transmission assets and the potential benefits of developing a more modern, distributed energy system, Lewis believes PG&E's transformation could have an "unintended upside" of setting an example for broader electricity market changes. "This is a perfect moment to restructure the utility business model to have a separation between the transmission grid and the distribution grid, and ultimately to force investor-owned utilities to divest [from] transmission grid investments," he said.